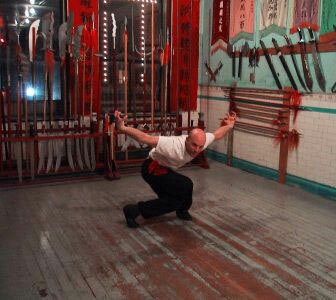 Hung Fut Kung Fu was created nearly 400 years ago at the Southern Shaolin Monastery in Fujian Province, China. Hung Fut was created by Wun Lei, a Buddhist monk and kung fu grandmaster. Wun Lei combined the powerful, hard style of Hung Gar with the flowing soft style of Fut Gar, creating the Southern Shaolin Hung Fut Kung Fu. 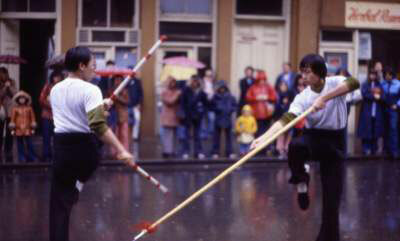 Hung Fut is a left handed style unique in its incorporation of linear, circular, and angular techniques which result in movements that are powerful and explosive, yet precise, flowing, and without rigidity. Wong Sheung Hung Fut is built on a base of 10 stances. For each of these stances there are 8 hand techniques. These 80 basic techniques are grouped together in sets of 10, one technique for each of the ten stances. A student must be proficient in 50 of these basic hand techniques before advancing to higher levels of training. This includes open hand and weapon forms as well as advanced applications. Hung Fut incorporates many different hand forms. These include animal forms such as tiger, crane, panther, snake, dragon, monkey and eagle. As well, there are also specialty forms such as drunken, Hung Gar family forms such a Southern Fist and Fut Gar family forms such as Buddha Palm. Hung Fut also utilizes many weapons. These include: staff, spear, broad sword, straight sword, butterfly knives, tiger hooks, daggers, axes, hoe, bench, and 3 sectional staff. Develop fitness, confidence, respect, discipline and focus.